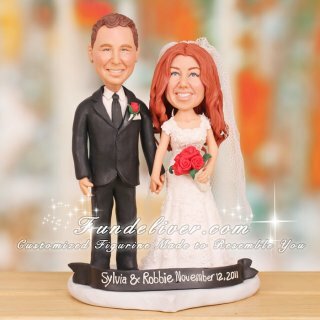 This is a completely customized romantic wedding cake topper ordered by one of our customers. They would like their figurines to be standing side by side holding hands. The groom is about 6'3" and the bride is about 6" tall with her heels on. So they would like their figurines to reflect the height difference. The bride figurine is holding a bouquet of red roses with an ivory satin ribbon around top of stems. Also she is wearing a soft ivory color wedding gown which has lace and a keyhole back, cap sleeves and sweetheart neckline. The groom figurine has a single red rose boutonniere on his lapel, wearing a tuxedo with black jacket, pants, soft ivory shirt, and long black satin tie. For the base, they would like the base to be in a nice silver color, with the nameplate to be in black with the names and wedding date written in silver. 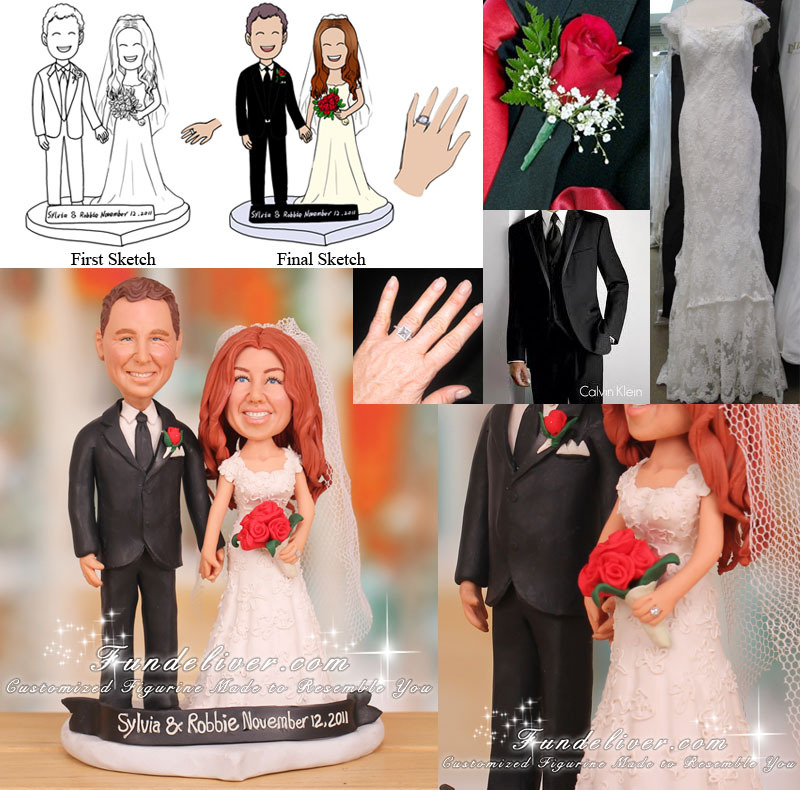 Looking for romantic cake toppers? We can customize one for you. Your likeness and wedding outfits will be replicated by our talented designers and sculptors to match your personalities and wedding. Just send us your ideas and reference images, we will first design some 2D sketches to get your approval and then turn them into 3D figurines.